1 July 1914: Entered the Royal Württemberg Army as a Fahnenjunker in the 3rd Company of 10. Württembergisches Infanterie-Regiment Nr.180. 3 August 1914: Transferred to the Replacement Battalion of Infantry Regiment 180. 28 August 1914: In the field with Infantry Regiment 180. 15 May 1915: Transferred to the 8th Company of Reserve Infantry Regiment 122 as a Platoon Leader. 25 September 1915: Severely wounded in the face (lost his nose) and captured by the French in the Champagne south of the Somme. December 1916: Repatriated to a hospital in Constance, Switzerland. 4 September 1917-11 January 1918: Returned to Germany and transferred to a hospital and convalescent home in Tübingen where he had his nose rebuilt; also assigned to the Replacement Battalion of Infantry Regiment 122. 11 January 1918: Assigned to the 10th Company of Infantry Regiment 146, Army Group “Scholtz” in Macedonia. 1 June 1918: Appointed a Liaison Officer to the Turkish 8th Army in Palestine. 20 September 1918: Commander of the rearguard of the Turkish Army during the retreat from Palestine. 23 September 1918: Captured by the British in Palestine. 18 November 1919: Released from captivity and returned to Germany – allocated to the Processing Office of Infantry Regiment 180. 13 December 1919-31 July 1935: Served in the Polizei [Police] in Eßlingen and Stuttgart. Eberbach culminated his police career as Leader of the Organizational Department on the Reich Landespolizei Staff in the Reich Ministry of the Interior, Berlin, from 1 April 1935-31 July 1935. 31 January 1920: Officially separated from the Army. 1 August 1935: Returned to the Army with the rank of Major. 15 October 1935: Commander of Antitank Battalion 12. 9 December 1935-14 December 1935: Detached to the Signals Course for Commanders of Motorized Combat Troops at the Halle/Saale Signals School. 20 October 1936-30 October 1936: Detached to Sports Courses for Staff Officers at the Wünsdorf Army Sports School. 1 August 1936: Detached to Panzer Regiment 6 of the 3rd Panzer Division. 2 July 1941: Commander of the 5th Panzer Brigade of the 4th Panzer Division on the Eastern Front. 16 February 1942: Army High Command Leader Reserve and, in the meantime, delegated with the leadership of the 4th Panzer Division. 1 April 1942: Commander of the 4th Panzer Division on the Eastern Front. 26 November 1942: Delegated with the leadership of the XXXXVIII Panzer Corps on the Eastern Front. 1 December 1942: Wounded/in hospital/Army High Command Leader Reserve. 10 February 1943: Commander of the Panzer Special Staff. 28 February 1943: Inspector of Panzer Troops in the Replacement Army. 15 October 1943: Delegated with the leadership of the XXXXVII Panzer Corps on the Eastern Front. 22 October 1943: Delegated with the leadership of the XXXXVIII Panzer Corps on the Eastern Front. 15 November 1943: Delegated with leadership of the XXXX Panzer Corps on the Eastern Front. 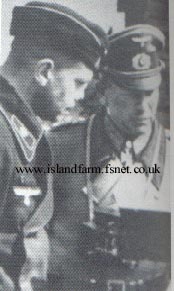 25 November 1943: Again, Inspector of Panzer Troops in the Replacement Army. 1 June 1944: Detached to Army Group Army Group B on the Western Front. 3 August 1944: Commander of Panzer Group West in France. 5 August 1944: Delegated with the leadership of the 5th Panzer Army in France. 8 August 1944: Commander of Panzer Group “Eberbach” in France. 22 August 1944-31 August 1944: Delegated with the leadership of the 7th Army in France. 31 August 1944: Captured by British troops while on a forward reconnaissance near the Seine River, France. 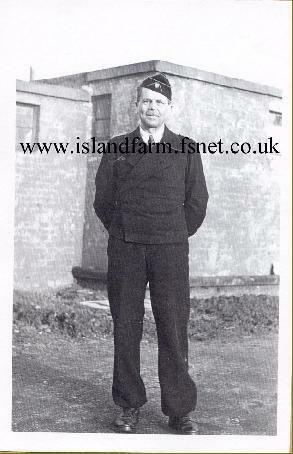 31 August 1944-6 January 1948: Prisoner of war in British captivity. 6 September 1944 transferred to Trent Park Camp 11 sorting camp. 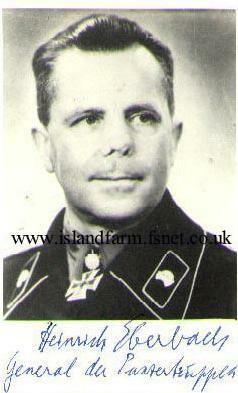 Knight’s Cross of the Iron Cross: 4 July 1940, Oberstleutnant, Commander of Panzer Regiment 35. Oakleaves (No. 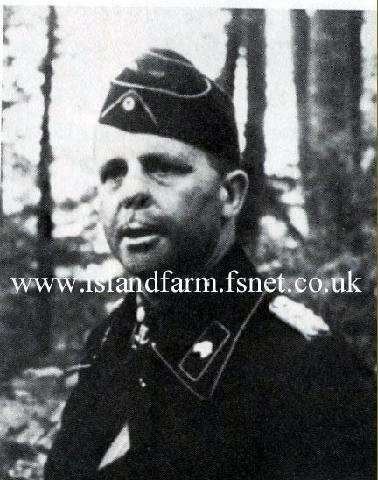 42): 31 December 1941, Oberst, Commander of the 5th Panzer Brigade. Army Honor Roll Clasp: 8 December 1941, Oberst, Commander of the 5th Panzer Brigade. Prussian Iron Cross, 1st Class (1914): 4 October 1917. Prussian Iron Cross, 2nd Class (1914): 12 October 1914. 1939 Bar to the Iron Cross, 1st Class (1914): 2 October 1939. 1939 Bar to the Iron Cross, 2nd Class (1914): 23 September 1939. Württemberg Friedrich Order, Knight 2nd Class with Swords: 28 June 1917. 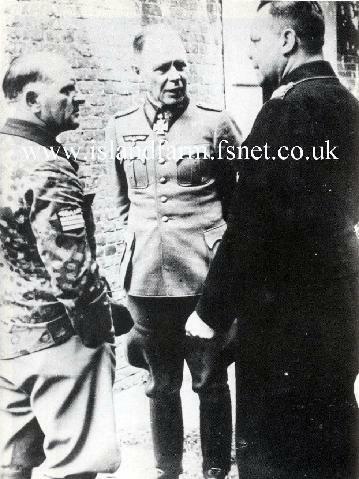 Heinrich Eberbach having a battlefield conference with two other senior generals in late July 1944 during the Normandy Campaign.